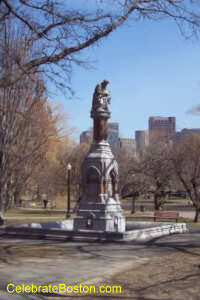 On the thirteenth of March, 1866, Mr. Thomas Lee, a retired merchant in Boston, sent a communication to the city government, with the following munificent offer: "I propose to erect and present to the city a monument in the form of a fountain, as an expression of gratitude for the relief of human suffering occasioned by the discovery of the anesthetic properties of sulphuric ether." The offer was promptly accepted by the city government, and an order was approved by the Mayor on the twenty-seventh of March, 1866, "That whenever the Memorial Fountain, presented by Thomas Lee, Esq., to the city, shall be completed and erected, the Water Board shall cause the same to be supplied constantly with as much water as may be necessary to give the fountain its proper effect." The monument was completed and surrendered to the city on the twenty-seventh of June, 1868. The monument was designed by Messrs. Ware & Van Brunt. Its form is suggested by medieval types, as modified by the nature of the material (white Concord granite) used in its construction. It is about thirty feet in height, and arises from a square basin. Each vertical face of its base has a niche, containing a spouting lion's head with sculptured aquatic plants. A surbase sustains a die contained in a canopy, supported by eight stunted shafts of red Gloucester granite. Above the canopy are mouldings, and above these a grouped quadripartite shaft of polished red granite. The capital is decorated with oak leaves, and bears on its abacus a group setting forth the story of "the good Samaritan." The four sides of the die contain bas-reliefs: (1) A patient under the influence of ether undergoing a surgical operation, (2) The angel of mercy descending to relieve suffering humanity, (3) A wounded soldier under the hands of surgeons in a field hospital, and (4) An allegory of the triumph of science. The principle inscription is: "In gratitude for the relief of human suffering by the inhaling of ether, a citizen of Boston has erected this monument, A. MDCCCLXVII." Read a detailed story about events that led to the historic operation, as well as a description of the famous operating room at Massachusetts General Hospital.